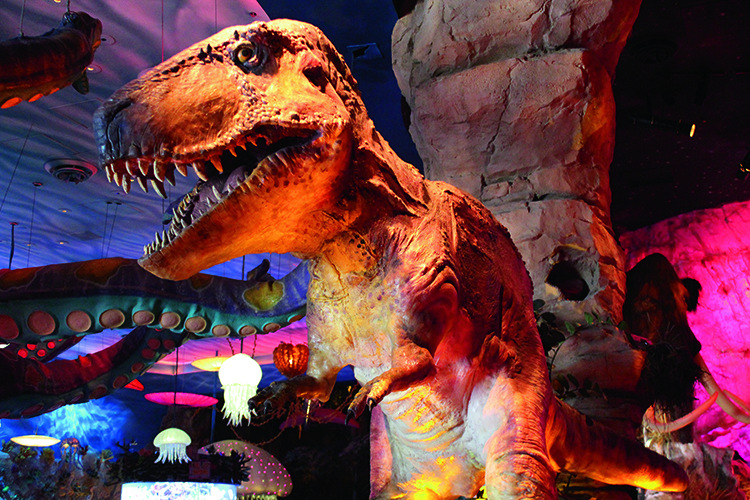 The popular T-Rex Café at Disney Springs, formerly Downtown Disney Marketplace, at Lake Buena Vista, Florida is a monster-sized, Palaeozoic-themed restaurant that bills itself as a ‘Prehistoric Family Adventure’. 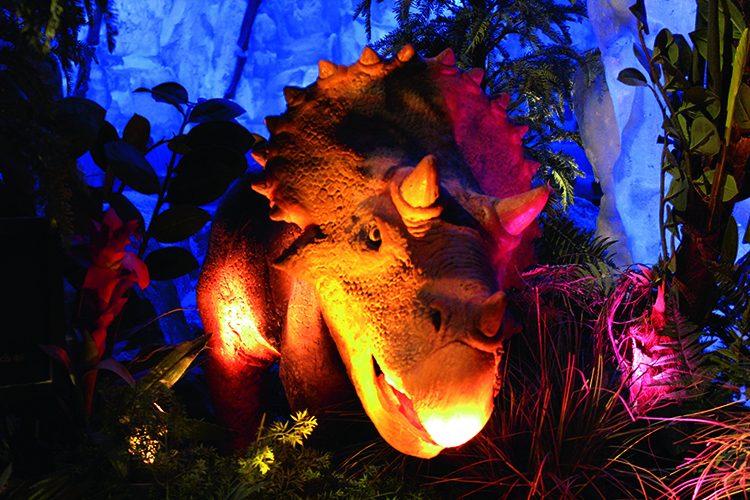 The theming is extensive and spectacular, and certainly includes enough pre-historic atmosphere to stir the imaginations of dinosaur enthusiasts of all ages. A star ceiling and suspended models of the planets provide an outdoor nighttime atmosphere to a large section of the dining area. Several times an hour, this tranquil night sky is disturbed by a massive meteor shower which agitates the animatronic beasts who are further terrified when a massive asteroid crosses the sky and smashes into the earth, shaking the building with 8kW of sub-bass rumbles and crashes. Cinematic quality HD video content for the meteor shower was created by AVHD Visual Solutions, Canada. This is the famous Cretaceous–Paleogene event, which is thought to have brought on the extinction of the dinosaurs and the rise of us mammals. Although the entire attraction has been running successfully and reliably for many years, some improvements were needed. 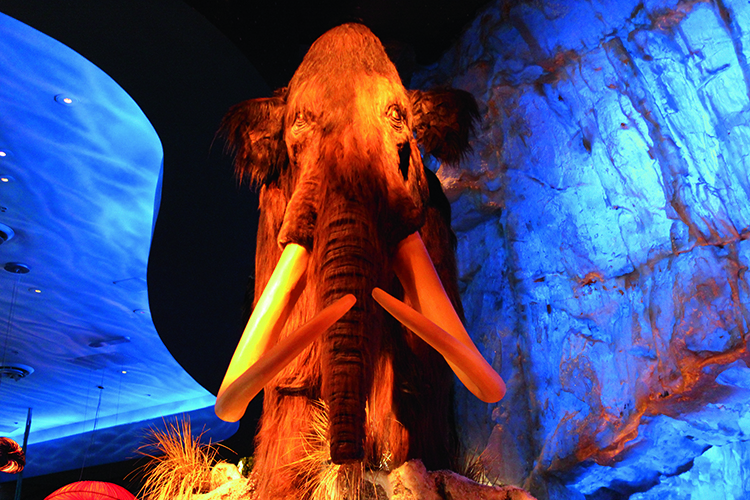 “In particular, the five 4K-lumen projectors blended to deliver the meteor and asteroid show, together with a single projector in the retail area, needed occasional replacement lamps and realignment of overhead projector blends after each re-lamping,” said Kevin Zevchik, US Manager at AV Stumpfl Inc.
AV Stumpfl and local integrator Zanim8tion came up with a powerful solution for the lamp issue and an ingenious one for the projector alignment, bringing the T-Rex Café from prehistoric audiovisual to the brink of what’s possible today. Despite their effectively-infinite lamp life, the projectors will still require regular maintenance visits to clean the optics and change the dust filters, which will inevitably have some impact on their alignment. This where the café’s new AV Stumpfl Wings VIOSO system that controls the projector blends and media replay comes into its own. “Once the maintenance crew has finished handling the projectors, Wings VIOSO uses a small, dedicated camera pointed at the ceiling to automatically realign the images and the blends, and have the show ready within five minutes of completing projector maintenance. Nobody is going to miss the tedium of projector alignment,” said Kevin. 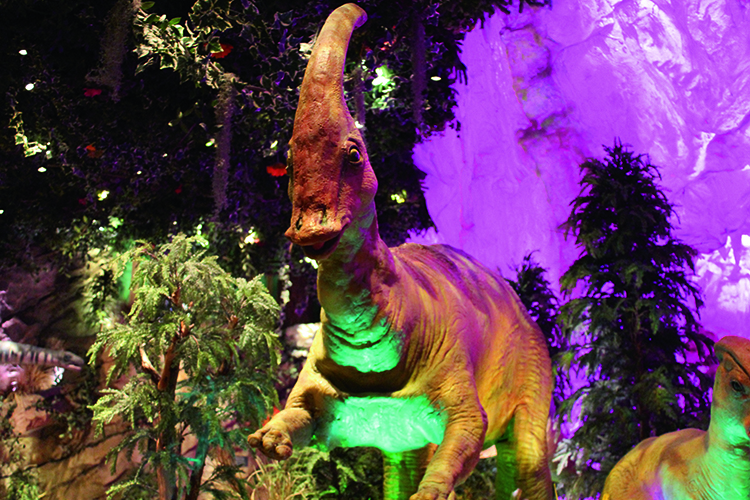 The flexibility and ease of programming of the Wings AVIO system has allowed the development of new movement sequences and the independent programming of individual dinosaurs for the educational tours. By taking advantage of the new Wings Touch user interface system the entire replay system can now be controlled from simple tablet devices when staff need to conduct tours or customise the entire venue for specific events and applications.